So one lunchtime, I head back to Cantopop, a cha chaan teng ("tea restaurant", kinda like a diner) with an organic/natural/locavore manifesto, helmed by Margaret Xu of Yin Yang fame, and backed by IHM of Posto Pubblico and organic veg retailer Homegrown Foods. 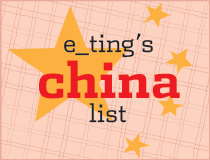 I was eager to try their sous vide char siu that has quickly become the talk of our little foodie circle (as has the homemade "spam", or luncheon meat), as well as the "music egg" of which their press releases speak so proudly. (Um, yes, that is a very long-winded way of saying I had the sous vide char siu and egg on rice). From a purely sensory perspective it was nothing to write home about. The char siu was too tough. The fatty bits were just jangly globules of fat and I felt they overdid it a bit with the mei gui lu (rose wine of sorts used in the char siu marinade). The fact that it's sous vide made it a nice, even pink, but I felt it also meant that the fat didn't burn and sizzle away, as much as it would if it were fired. It was finished off with a flame of sorts (a blowtorch?) for a super thin crust. If you just nibble the crust, it has a slightly toasty flavour that's great, but if you're just biting into it like a regular human being, these flavours are instantly overwhelmed by the rose wine and diluted by the rest of the non-blowtorched pork. The egg was cooked to a perfect sunny side up - the way I like it - so you can mix the yolk into your rice for a risotto-like finish. But the egg itself wasn't any more tasty than an ordinary supermarket egg, despite being a much darker orange. By the way the music egg supplier is probably this place, where the chicken are local, but don't seem to be free range or organic. They just listen to a lot of music while sitting in their Hong Kong cages. Funnily enough I was quite impressed by the rice. It didn't really have the aroma/taste of good rice (ie. 飯味 faan mei - I explain more here), but it was cooked well - fluffy, complete grains, sticking together but only slightly, like rice at home, and didn't suffer from the soggy overdoneness that usually plagues cha chaan teng or fast food rice (that is probably the result of sitting too long in a massive cooker, absorbing its own condensation). I also tried the milk tea, Hong Kong-style of course, but it was again underwhelming. For Kee does a much better version, in my opinion, with a 茶膽 cha daam, or a tea "starter" or "base" of sorts in their central pot/drinks bar that gives a much tastier brew, probably because it's been going for so many years - these things take time. Despite all this, Cantopop was positively buzzing at lunchtime. By the time I finished, which was about 2.15pm, people were still walking in. I also heard the table behind me going on about how amazing it is that it's organic and so on. It's a nice, schmick, air-conditioned place to sit, with proper cutlery and all, and I might go again with my squeamish out-of-town friends if they insisted, so getting good business certainly doesn't seem to be an issue. It was also nice to see Margaret hanging out there too, and no doubt her (many) fans would like that. 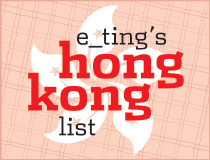 Ironically, opposite Cantopop is Tai Hing, a roasted meats chain that does pretty well in my opinion. 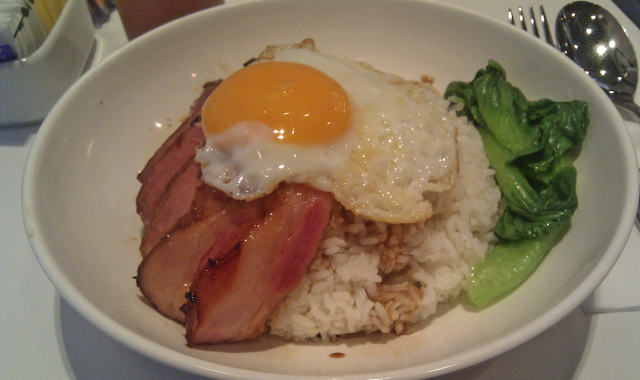 A char siu rice with egg there would probably set me back about $40, whereas Cantopop is charging $68. Like my mom, I'm willing to pay a little more for good organic produce. But it has to be good. The whole point of organic, taste-wise, is that it should taste better, more true to what it's supposed to be, because of the increased time and effort farmers are putting into it (as opposed to industrialised farming). But when it's not, it's just a pointless premium. If it doesn't taste better, truer, it says to me that you're not "doing" organic right. Eating to 'help the world' is great, but like so many other writers have said recently, we shouldn't go all bezerk and fangirl over things just because it's from a farmers market. We should encourage and support those who are doing it right. But what do I know, all I had was a char siu faan. They should use Taste to dictate over Recipes in my honest opinion. This version you ate is already supposed to be the updated version! I had the same experience with my family when we started having organic vegetables delivered at home and dad and the kids weren't old.. tasted so much better but it's a pity when organic becomes hype and taste suffers for style. I still hadn't been yet but now not too sure I want to after reading all the foodies' comments. Rita - thanks! They had charred bits but it wasn't really the same (or better) than the normal variety. I love the charred bit - I always steal the end bits! HKFG - I'd wait a bit before trying. I just went back today - the luncheon meat was ok and the egg was consistent but all in all a bit blah at the moment. Definitely gonna give a try to this place. If you go more, let us know if you try more dishes.